Schenectady, N.Y. — As the winter months approach each year, the threat of cold and flu lingers in the back of everyone’s mind. No place is this truer than schools and universities, where thousands of students, faculty and staff congregate, bringing their germs with them. It’s a war that the veteran facility manager is well-armed to fight, bringing a host of infection-fighting technologies to the fore, and not just hand sanitizer (although there is certainly plenty of that). “We have sprays over our bathroom door handles that periodically release germicide to eliminate the viruses and bacteria that people leave behind,” explains Yauney. Also in his infection-fighting arsenal is an electrostatic fogging machine that can decontaminate an entire room, even under the tables, during an outbreak. “All of our disinfecting agents are environmentally friendly,” underscores Yauney, as he explains a pressure washer he uses to clean bathrooms once per week. In fact, his stockpile of disinfectant has even become a source for other local facility managers when they run out of sanitizing agents at their facilities. Recently, Yauney deployed the ultimate weapon in infection control – Ultraviolet-C (UV-C) Germicidal Irradiation – which has fostered an affordable level of upper air purification previously unattainable. UV-C systems have been used to control airborne infectious diseases in schools and hospitals since the 1940s. Today, UV-C light is used in health care facilities to decontaminate surgical and patient areas and even to destroy the Ebola virus in as little as five minutes. 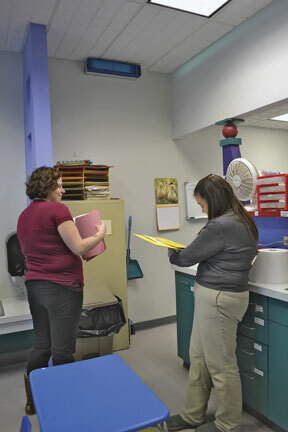 Yauney’s earliest memories of UV-C lighting was as a child visiting the pediatrician. “I remember the lights being mounted over my doctor’s door to kill germs,” he says. 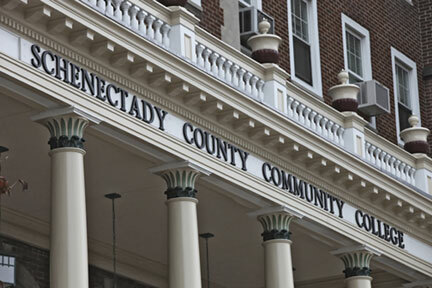 With these experiences under his belt, Yauney knew that UV-C would be an effective tool for infection control at Schenectady County Community College. After learning about the affordable GLO upper air germicidal UV-C light fixture, Yauney knew he had the ideal solution for his institutional application. David Crowley, Territory Sales Manager for Camfil USA, Inc., a manufacturer’s representative, introduced the college’s facility director to the high-output GLO UV-C fixture from UV Resources. The patent-pending GLO fixture delivers the industry’s greatest amount of upper room UV-C dosage – up to 350 percent more irradiance than conventional upper air UV systems. This increase in irradiance levels translates to greater UV-C coverage, enabling infection control specialists to treat more area with fewer fixtures, saving both cost and energy. The wall-mounted fixture creates an irradiation zone within the upper region of most any space. Virtually all infectious agents carried upward by convection currents are killed by the ultraviolet irradiation. Different UV-C systems exist for wall- and HVAC/R applications. “In this case, the college wanted the ability to provide on-the-spot infection control with specific stand-alone installations of the UV-C upper air fixtures,” explains Crowley. At roughly $550 per unit – or half the cost of conventional upper air fixtures – the GLO’s affordability was another major factor in the decision. Wishing to spare no expense on health and safety, Yauney moved forward to purchase and install 20 GLO units across campus at a total cost of roughly $11,000. Units were positioned in the areas where infections are typically most entrenched, such as the cafeteria and daycare center. “We installed between five and eight units in the daycare center alone because young children tend to be ill more frequently than adults and their interaction with one another makes transmission rates higher” says Yauney. 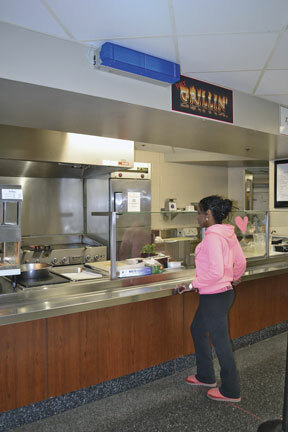 Units were also installed near the security desk, the cafeteria and Café, as well as the student forum and lounge. One installation challenge was how to position the fixtures so that students could not look directly into the harmful light. To minimize direct exposure to UV-C light, the GLO fixture has baffles that direct and angle the ultraviolet light upward and out of the line-of-sight. 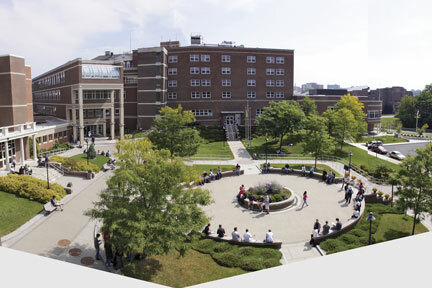 Some areas at the college are multileveled, however, so units were strategically placed to avoid exposure to the students. Other areas, like the elevators, were avoided for fear that students would purposely try to access the lamps without realizing the danger of direct UV-C exposure. “Teenagers don’t always think about consequences, so we wanted to avoid any possibility of harm,” explains Yauney. 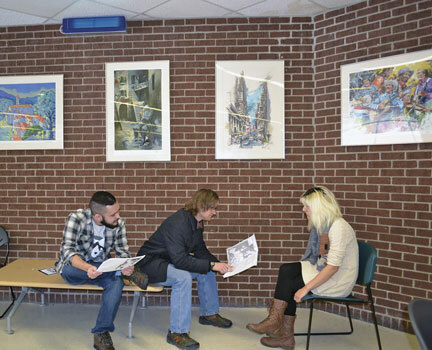 The installations took place over a period of several months, beginning in the spring of 2015 and ending shortly before school resumed in the autumn. Although there is no available empirical data that can assess the units’ performance, knowing that germs are being continuously eradicated is enough for Yauney. A member of the Association of Physical Plant Administrators (APPA), Yauney argues that although most facility managers are probably not as germ-conscious as he is, it’s a good trait to have. “Anywhere you put thousands of people in close proximity, be it a hospital, airport, large office building or college, it’s advisable to try to eliminate disease transmission as much as possible. Otherwise, the money you save will be lost to absenteeism and poor indoor air quality,” asserts Yauney. 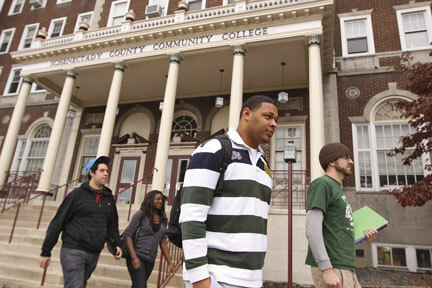 In the case of Schenectady County Community College, students, faculty and staff can feel safe and secure knowing that their ever-watchful facility director is employing the latest in infection control to help keep them healthy and germ-free. 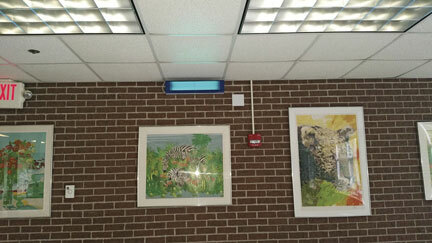 Schenectady County Community College in Schenectady, N.Y.
A GLO upper air fixture from UV Resources (above) disinfects the air in the student lounge at Schenectady County Community College. The GLO upper air fixture from UV Resources (mounted above at Schenectady County Community College) delivers up to 350 percent more irradiance than conventional upper air UV systems. The GLO upper air fixture from UV Resources (mounted above the cafeteria at Schenectady County Community College) provides the industry’s greatest amount of Ultraviolet-C (UV-C) energy fluence, or dosage, without the use of additional power, heat or special UV lamps. 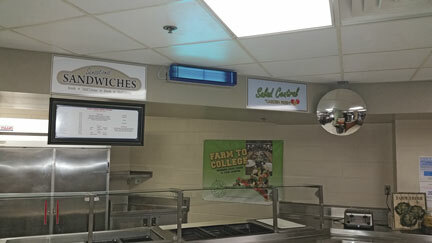 Students order food in the cafeteria at Schenectady County Community College as a GLO upper air fixture from UV Resources disinfects the air. 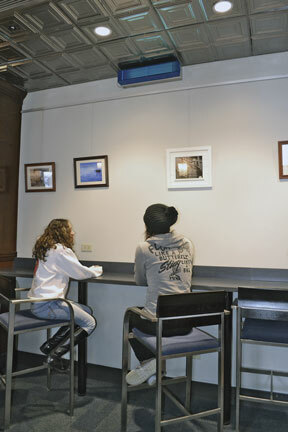 Students meet at the Canal Side Café at Schenectady County Community College as a GLO upper air fixture from UV Resources disinfects the air. The GLO upper air fixture from UV Resources shown here disinfecting the childcare center at Schenectady County Community College. The lamp is ideal virtually anywhere there is a threat of infectious diseases.